This feature applies to data tabs with grid/table-based interface. Note: When Save Autofill Values is set to False in the EDGE - Application Options, entered values will only be maintained for the current EDGE session. The Auto Fill feature allows for significant reduction of time spent on entering constant and repetitive values. It allows values to be entered into multiple rows at once or provides the option to set the default value to newly added rows. 1.Select the rows that the Auto Fill will be applied to (skip this step if setting value for new rows only). 2.Click the Auto Fill tool located on the Form tab. Once clicked, the Auto Fill interface, which contains a list of columns that Auto Fill can be applied to, will be shown. 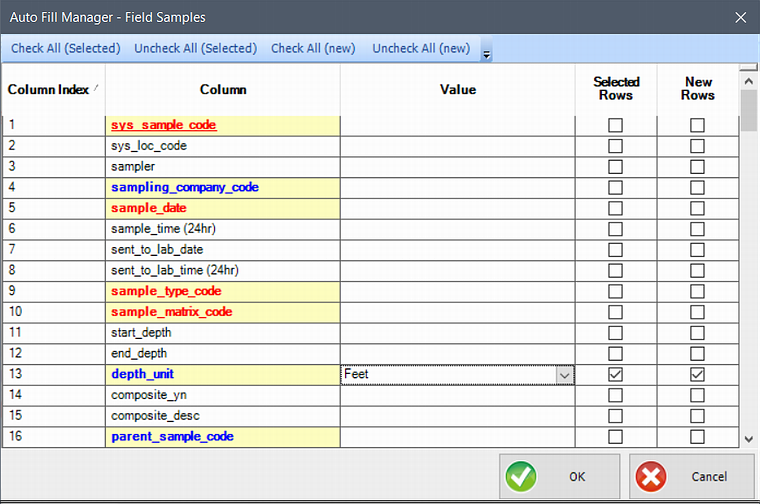 The following example applies to the Field Samples data tab of the EQEDD format. In the form above, enter values under "Value" for each applicable column. Also check the option for whether the entered value will apply to selected rows, and/or to new rows. Note: Entered values are saved and recalled the next time Auto Fill is used. To enable or disable this feature, please refer to EDGE - Application Options.